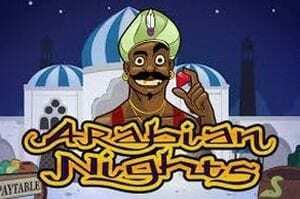 Arabian Nights, the first Progressive slot from Netent ! Arabian Night is an enchanting Netent slot with an oriental night theme. It will transport you to one of the warm summer nights of the Middle East in ancient times. The slot provider uses symbols directly linked to this universe which may be dangerous but also magic and wildly exciting, especially since a progressive jackpot which can be worth millions is at stake, which is enough to leave no one indifferent! To recreate this mystical universe, Netent uses symbols which make us travel back in time: a machete to defend one’s self, some babouches, a tent to pitch in the desert, a red fez, and even a camel to in order to travel. All of this is designed with refinement, and the song of cicadas punctuated by the occasional hoot of an owl creates the ideal setting for players to begin their Arabian adventure. The game reaches a fever pitch when you obtain winnings or Free Spins, the felted sound effects being replaced by bewitching oriental music. To obtain the Arabian Nights Free Spins which multiply winnings by 3, you must hit one of the Scatters which are represented by a golden magic lamp embellished with precious stones. The Wild symbol appears as an Arab merchant holding a ruby. Arabian Nights is a 5-reel, 3-row Netent slot with 10 fixed lines. The winning symbols must line up on one of these 10 lines, from left to right, in order to generate a win. Out of the 95.62% of return to players (RTP), 65.6 % of it is obtained through these 10 lines during the main game. For a big win, the best combination with minor symbols is a line of 5 machetes for it pays 2,000 coins. A line of 5 babouches pays 1,000 coins, while 5 tents pay 500 coins, as shown in the Netent Arabian Nights paytable. The Wild is easy to pinpoint for it is the only symbol representing a human figure. It may replace any of the symbols mentioned above to form a winning line (except the lamp scatter symbol). 5 Wild is synonym of Jackpot Progressive Win ! The most exciting feature of this video slot is its progressive Jackpot which is built up from each play made. To hit this jackpot, which can be worth millions, the screen must display 5 Wild symbols on one of the 10 winning lines. If you obtain this perfect combination, the jackpot is yours! The Arabian Nights slot offers an interesting free spin feature during which the gains are tripled (with the exception of the jackpot). In order to trigger the Arabian Nights Free Spins, you must obtain at least 3 magic lamps. No genie will appear, however you will benefit from 15 Free Spins during which it is possible to obtain an additional 15 Free spins if 3 new magic lamps appear anywhere on your computer, smartphone or tablet screen. The Free spins have a Hit Frequency of 0.75%, which means (as per Netent stats) they fall on average every 133-134 rounds. With its 10 paylines, This Netent slot guaranties a thrilling gaming experience to all bettors which will see themselves carried away to the Middle East in a quest for a treasure, but also for the Arabian Nights progressive jackpot! The maximum gain of this online game being 120,000 coins on a winning line, a bettor which plays with the maximum bet of 200 may win up to 240,000. With the minimum bet of 0.10, the highest win is of 120. The Arabian Nights slot payout is 95,62%, the RTP of the Global and Local Jackpot Total Game are of 95.22% and 95.62%. As regards the main game, it is of 65.5% payout and of 25.10% RTP during the Free Spins. You can play that game on Casumo Casino.